iPhone 8 / iPhone 7 Case with Wide Lens Kit || Moment Black Canvas Photo Case plus Wide Lens || Best iphone wide attachment lens with thin protective case. This is our everyday, go-to mobile photography kit. The photo case is an affordable, thin, and durable case to protect your phone from parking lot drops or tree branch scratches. While our award winning lens and its new aspherical design captures stunning images with edge to edge clarity without any fisheye distortion. Available in wood or black canvas, this is for everyone who loves their camera phone. CAPTURE 2X MORE PICTURE When you put on the Moment Wide Lens, you instantly notice a dramatic difference with more in the picture. Landscapes are more epic. Food has more table context. People are better proportioned in the shot. 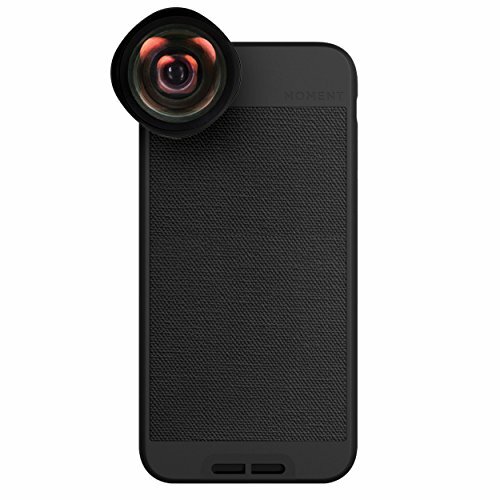 iPhone 8 and iPhone 7 (ONLY) - Photo Case plus New Wide Lens Kit. Our award winning lens combined with our thin, everyday case. If you love your camera phone, this kit is for you. Click on our store name for other sizes and accessories. What makes our wide lens unique...It has a multi-element glass design that provides edge to edge clarity. Unlike the cheap lenses you find on Amazon, this lens has five layers of cinema quality glass and is handmade with aerospace grade metal.